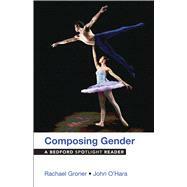 Composing Gender explores questions around the central concept of gender: Is gender binary, or more complicated? How do we define gender and sexuality? What stereotypes, expectations, and rituals shape gender? What influence does the media have on gender? Readings by a range of feminist scholars, journalists, gender theorists, biologists, legal scholars, sociologists, and others take up these questions and more. Questions and assignments for each selection provide a range of activities for students. The Web site for the Spotlight Series offers comprehensive instructor support with sample syllabi and additional teaching resources. The Bedford Spotlight Reader Series is an exciting new line of single-theme readers, each featuring Bedford’s trademark care and quality. The readers in the series collect carefully chosen readings sufficient for an entire writing course—about 30 selections—to allow instructors to provide carefully developed, high-quality instruction at an affordable price. Bedford Spotlight Readers are designed to help students make inquiries from multiple perspectives, opening up topics such as money, food, sustainability, and gender to critical analysis. The readers are flexibly arranged in thematic chapters, each focusing in depth on a different facet of the central topic. An Editorial Board of more than a dozen compositionists at schools focusing on specific themes have assisted in the development of the series. Chapter One: Is Gender Either/Or (or Something Else)? Barbara Kantrowitz and Pat Wingert, Are We Facing a Genderless Future? Chapter Two: How Do We Become Boys and Girls? Peggy Orenstein, What’s Wrong with Cinderella? Chapter Three: What Rituals Shape Our Gender? Chapter Four: How Do We Define Sexuality? Chapter Five: How Does the Media Shape Gender?